South Lampung, Indonesia – The wedding party had already begun when the first wave struck Rajabasa, a village in South Lampung on the Indonesian island of Sumatra. At first, Abdulrahman the village head and the dozens of other unsuspecting guests thought there had been a car accident. “We were chatting and then there was a loud crash,” Abdulrahman, who like many Indonesians goes by one name, said. “We all ran to the road to see if there had been an accident. Then we saw the water. The first wave was quite small, but the second one was much larger and stronger. Everyone panicked and we turned and ran for our lives,” he added, noting that there were “no warning signs at all”. A devastating tsunami struck the islands of Sumatra and Java on Saturday evening, sending a wall of water crashing some 20 metres inland and leaving behind a trail of destruction. Experts believe the seismic sea wave was triggered by an underwater landslide caused by the eruption of the nearby Anak Krakatoa volcano, located on the Sunda Strait between Java and Sumatra. As of Monday evening, the death toll stood at 373 people, with 1,459 injured. A further 5,665 were displaced, according to the latest update on Monday by Sutopo Nugroho, the spokesperson of the Indonesian Disaster Agency (BNPB), while 128 others were still missing. In Rajabasa village, the wedding party was taking place about 30 meters from the shore, so most of the guests were able to scramble to higher ground. Others, however, were not so lucky. Magdalena had decided not to attend the wedding festivities as her three-year-old daughter wanted to sleep. When the waves came, her small wooden house, sitting some 10 metres away from the shore, collapsed on top of both of them. “We found Magdalena wrapped up in her mosquito net inside the house that night. Her daughter Anisa washed ashore in Sukaraja village about a kilometre-and-a-half away the next day,” Abdulrahman told Al Jazeera on Monday. 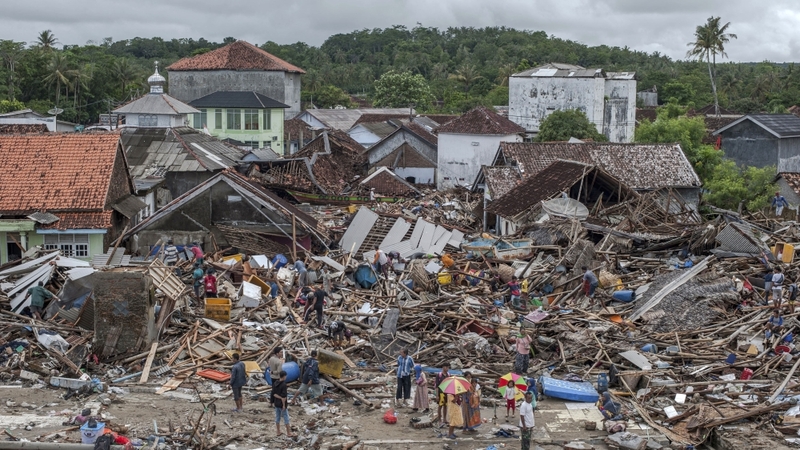 The area along the coastline around the districts of Kalianda and Rajabasa bore the brunt of the tsunami that hit Sumatra. Hundreds of homes and business have been washed away – destroying the livelihoods of many locals in the process. Medi Herlianto, director of emergency facilities at BNPB, flew in by helicopter from the capital, Jakarta, on Sunday to assess the damage along the coastline in South Lampung. The agency has not finished compiling data, but in South Lampung alone, at least 58 people have been found dead, 250 injured and eight are still missing and presumed dead. “There is no chance that there are any more survivors at this point,” Herlianto told Al Jazeera. “Our goal now is to work with the local government to provide humanitarian aid and help with the evacuation process,” he said, adding that some 1,000 people in South Lampung were displaced. Arinal Djunaidi, the incoming governor of Lampung, told Al Jazeera that he is committed to helping the survivors of the ruinous tsunami. “We need to help them get back to their daily lives as soon as possible and start the cleanup process. We have brought in 13 excavators to help move the debris and have already cleared the main roads to the villages in the area,” he said. Local residents such as Abdulrahman are also providing assistance on the ground. In Rajabasa village, a command post has been set up to distribute food and clothing donations from residents in neighbouring areas. For now, the post is run only by men. Women, children and the elderly have been moved to temporary shelters on higher ground in case of another tsunami. Experts have warned that if Anak Krakatoa continues to erupt, it could trigger more underwater landslides and more deadly waves. For Abdulrahman, who has lived in Rajabasa village all his life, the fear is real. Abdulrahman and groups of male residents from Rajabasa village have been keeping watch around 10 meters away from the shoreline to guard the homes that are still standing and have now been vacated. He said that many of the volunteers are afraid but are trying to remain sanguine. “We feel calm knowing that our wives and children are safe on higher ground,” Abdulrahman said. “Of course we’re scared that another tsunami could hit our village of any time, but we grew up here and our ancestors always told us that Krakatoa was a threat on the horizon.